This challenge was to combine 3 or more separate stamp sets on one card. I chose these sets: New Best Friends, Feline Better, and Critter Condolences. 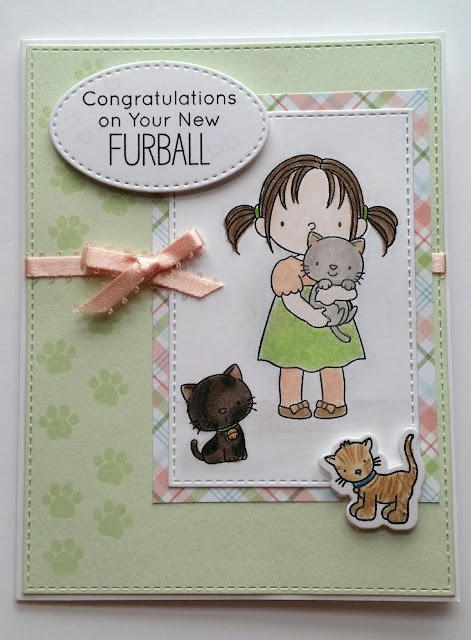 I began with cardstock cut from cool as a cucumber with the A2 stitched rectangle stax, added paw prints with clear embossing up the left side, wrapped ribbon around the panel. Stamped my images on a white rectangle and layered it on plaid before adding to the card. The sentiment and one of the cats are adhered with foam dots to add dimension.